Available this September, the new NX Eagle drivetrain is compatible with all levels of Eagle and comes at a great price. With a price of just $375 for an entire drivetrain, SRAM has done a great job of bringing many of their 1x12-speed technologies to their most affordable "NX" level. They've done this in part by making some material changes and using less costly manufacturing methods. We love that the individual components can mix and match with any of the higher-priced XX1, X01 and GX Eagle drivetrains. Keep in mind that the cassette range is slightly reduced from the 500% to 455% (10-50 tooth vs 11-50 tooth on NX) and requires a standard freehub body, not the SRAM XD driver most often seen with SRAM drivetrains. It does keep that hill-crushing 50-tooth cog, however, which is important for many riders. Dig into the specs and SRAM's claims, below. We've also provided key comparisons to the $495-545 GX Eagle drivetrain, which is the next step above NX. 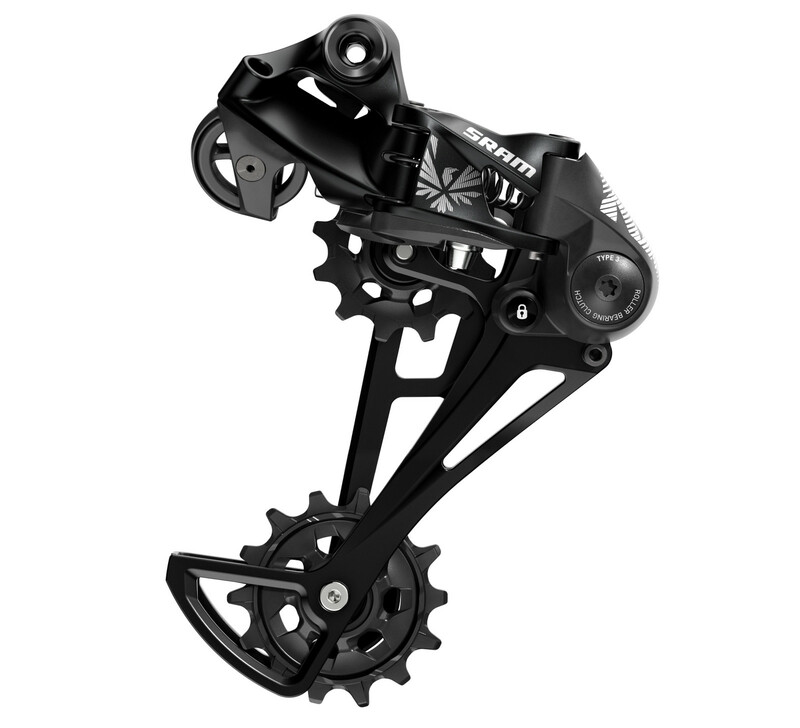 This new NX Eagle derailleur features the proven SRAM 1X-specific X-HORIZON design. The larger, 14-tooth X-SYNC lower pulley easily facilitates 11-50 and 10-50 tooth cassette capacity, and also adds to NX Eagle’s overall smooth-pedaling feel. The Type-3 ROLLER BEARING CLUTCH provides quiet, consistent performance and durability. Completely new rear derailleur incorporating our proven X-HORIZON design and Type-3 ROLLER BEARING CLUTCH technology. Eagle ecosystem-engineered mounting system and CAGE LOCK positioning add robustness. 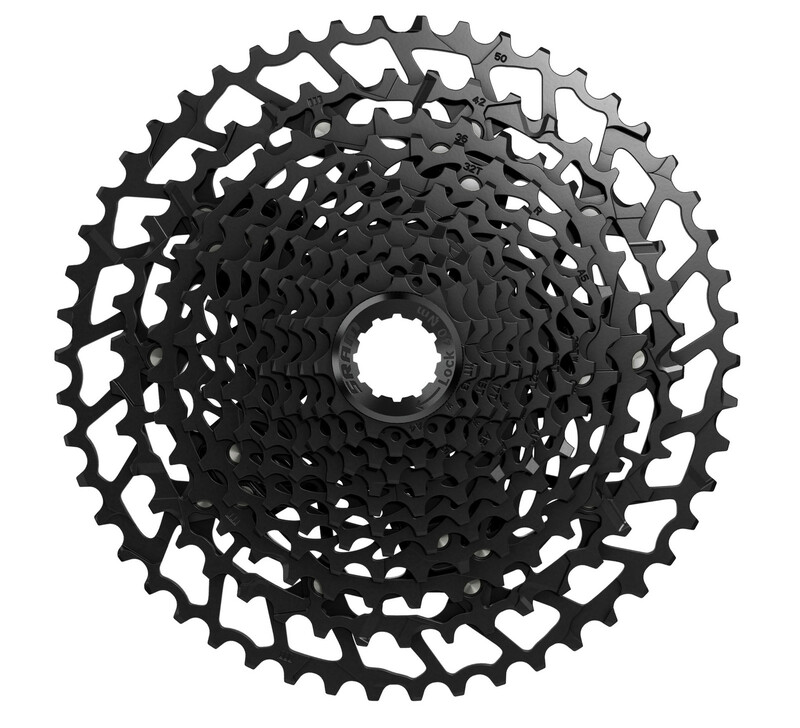 This PG-1230 cassette is an integral part of the SRAM Eagle drivetrain Ecosystem. Compatible with Matchmaker X clamp. The SRAM NX crankset delivers Eagle styling and performance to the newest addition to the Eagle ecosystem. Designed for SRAM’s X-SYNC2 chainrings, the NX crankset is engineered for complete chain control—each tooth’s profile is precisely engineered to work quietly, efficiently and securely with the Eagle chain’s inner and outer links. DUB technology features a better-engineered bottom bracket and a new spindle design, which together allows for a more uniform approach to bottom bracket fitment, better sealing against contamination and forward and backward compatibility. Now everyone can benefit from a new measure of performance and durability. DUB technology features a uniform approach to bottom bracket fitment, better sealing against contamination and is forward and backward compatible. The basis of every Eagle drivetrain is its chain—and the NX Eagle chain is designed and manufactured using genuine SRAM’s Eagle architecture, so it is fully compatible with every other component in the Eagle ecosystem. The NX Eagle chain features solid pin construction, Eagle PowerLock and smooth, efficient shifting that you can count on every time out. Eagle PowerLock chain connector with FLOW LINK technology provides better chain-guiding and increased longevity. Visit www.sram.com for more details. Shimano atleast believed in making a der that can survive multiple seasons of hard use without rattling itself apart. It's to get the whole group price down so that it can be specc'ed on lower end bike models. Product managers are looking to save $1 here, $0.50 here, $2 there so this helps them achieve that when putting together a low end bike. Of course. But when you’re buying in bulk it’s easy to get those additional points. The cranks and cassette are the big ones here that will bring the eagle gruppo to lower end builds. The previous 11sp gruppos, gx vs nx, at least had $20-$30 differences which helps the aftermarket consumer and shops get people onto a reasonably priced 1x drivetrain with varying budgets. If they truly used cheaper materials and processes, that shifter could be $25-$30 and the der should be $80ish. This would better reflect the “levels” that brands have built over the years. At the end of the day we’ll still be selling gx shift/der on a nx cassette. I’m just bitter I guess, inventory is already a nightmare in the bike industry, where we’re flooded with thousands of small parts that are continuously changing. To have what’s essentially duplicate parts with different skus is frustrating. 11 speed has more than enough range as long as you're not going much slower than walking speed. 10 speed or less would be more practical for mtb to be able to get up and down through the gears faster. I'm usually shifting 2-4 gears at a time on 11 speed already. 12 speed is for sales guys to push onto newbs just like plus tires. Regarding weight of the cassette; I'd take 1x any day for a hard tail as long as total price/weight/performance is about equal to 2x, and might even for a full suspension bike (with increased un-sprung weight) due to function and simplicity. interesting. haven't heard this. great insight. I'm totally opposite. Having ridden Eagle GX for 9 months (but I'm not putting as many miles as others might) I'd take it every time (coming from X0 2x10 and earlier 3x groups). My wife had X01 on her bike and it was noisy and never shifted great whatever I did to adjust it. Eagle GX has shifted great and been very silent since day one, and the added range is nice. i appreciate that they're making this standard freehub compatible but a 615g cassette is a bit of a monster. could drop ~0.4lbs on cassette alone with an XT 11speed offering. but of course, lower cost comes with less expensive materials so it's understood. a smaller large cog or something else to get the weight down would be excellent. Shimano: we are finally joining the wide range game with a 500 dollar alloy crankset and a proprietary free-hub body that will only be licensed to DT Swiss. Sram: Here's an eagle drivetrain group for 375 bucks that will work on just about any wheel. Shimano's got their work cut out for them to put out a competitive product to this. Shimano SLX is a much better value already. 12 speed is dumb. SLX could compete, but if Shimano follows their usual release schedule, it's 2 years before release. It is probably going to be very good, but Shimano will loose (some) sales to Sram until then. Current SLX isn't too far off with the 11-46 cassette, ~9% difference from Eagle NX in range, but the 9-tooth jump from 37 to 46 looks like they took the easy way out. Also 12 > 11 for many consumers. Last Eagle eTAP is coming, while Di2 is not coming this year it seems. I think Sram is ahead currently, but competition is good.